Scooby and Shaggy are on their way back fromt he movies when they come upon an abandoned truck with a suit of empty armor in the front seat. The rest of the gang come to investigate and end up taking the suit of armor back to the Country Museum--only to find out the suit comes to life in the light of the full moon! A beach party turns into a terrifying mystery when yachts start vanishing and a ghost in an old deep-sea diving suit pops up on the gang. Ever eager to solve the mystery, the gang meets with the Widow Cutler, who claims her black magic has brought back the ghost of her husband, Captain Cutler--a ghost who is making the yachts from a nearby marina, yachts responsible for his death, disappear! A day of boating find the gang lost when a fog rolls in--and ends up getting them grounded on Haunted Isle, home of Vasquez Castle--and it's resident Phantom! The gang gets lost and ends up in the old ghost town of Gold City. Deciding to stay, they get a room at a guest ranch in town, and end up running afoul of the ghost of the Miner 49er, who still haunts the abandoned gold mine under the town! When Scooby witnesses the dognapping of a prize poodle, it leads the gang into a mystery searching for the dognappers, using Scooby as bait. But when the plan goes wrong, the gang finds themselves mixed up with a haunted Pueblo mound and the ghost of Geronimo! A weekend trip to the gang's friend Sharon Wetherby's estate quickly turns into a mystery when Sharon's uncle Stewart vanishes--then turns up, aged into an old man! Things get worse when he tells them of the curse lain on him by the ghost of Elias Kingston, supposed heir to the Wetherby fortune, then Sharon disappears, and Uncle Stewart vanishes again, only to turn up aged to the point of being a skeleton! The gang are hired as extras for a movie being made by Daphne's uncle, JJ Maxwell. But before the filming can even get started, the movie's Apeman villain suddenly turns out to be the real thing, and the gang is launched into yet another mystery! A quiet picnic at the beach turns into a mystery for Scooby and the gang when nearby Funland amusement park, closed until summer, suddenly comes to life in a blaze of light and sound. The gang investigates, naturally, but finds the park eerily deserted--except for a frozen faced, stiff legged weirdy who keeps running amok all over the park! Scooby and Shaggy are on their way home with a pizza when a violin case bounces out of a car and lands in the street next to them. Being the Good Samaritan types, they pick it up in hopes of returning it--only to find it full of money! 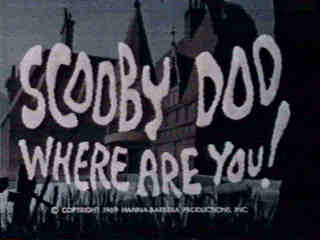 While Shaggy goes to call the gang and tell them, Scooby comes upon an injured poodle--and loses the case. It's the start of yet another mystery as the gang finds themselves on the trails of counterfeiters! The gang witnesses a bike crash between a circus strong man and a midget, an encounter that leads them to a haunted circus, one haunted by a Ghost Clown--an evil fiend whose determined to hypnotize them all right out of the picture! When the gang heads off to go sightseeing at Franken castle, they run into Dracula, Frankenstein and the Wolfman, all of whom haunt the place--and want to make them permanent residents, too! The gang, while helping a professor set up a mummy exhibit at a local museum, runs into an ancient mummy and an even more ancient curse--one that turns people to stone!